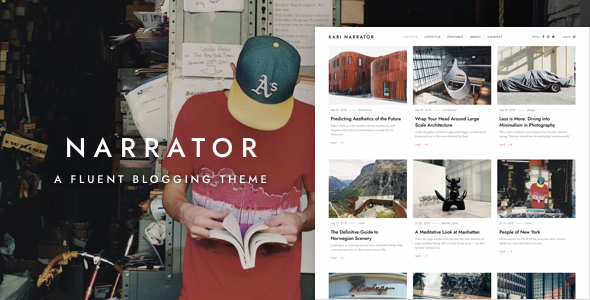 Narrator is a minimalistic WordPress blog theme built for smooth storytelling. 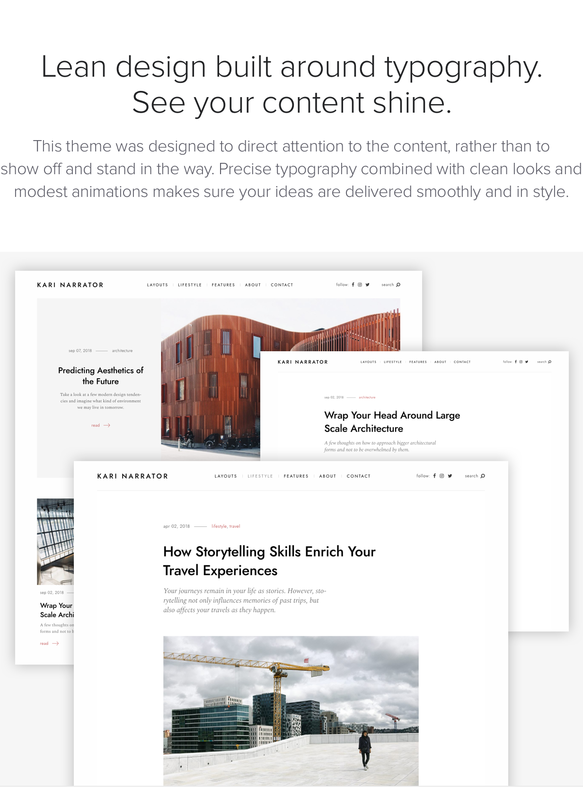 This theme offers clean uncluttered aesthetics to the reader and easy-to-use bloat-free experience to the author. 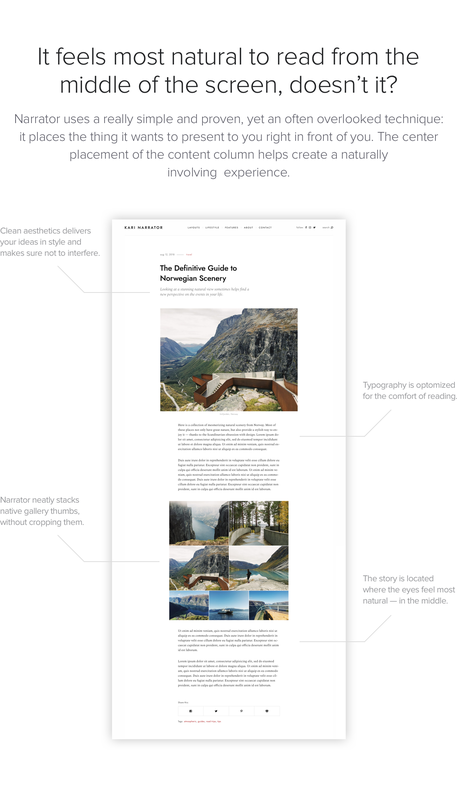 Narrator’s precise typography and simple layouts make it an excellent match for any creative media. Be it a lifestyle blog, a travel journal (travelogue), an architecture blog, an art blog, a curator’s blog, a fashion magazine, a music band blog, a photography blog, a writer’s blog, a food blog, a movie critic blog, an illustrator blog, or something else — Narrator’s eclectic unobtrusive minimalist design and great readability will make sure to deliver your ideas in style. This theme is customizable and offers several layout options: masonry, two-column and three-column grids. Narrator provides fullscreen swipeable picture galleries, which are built from native WordPress galleries. 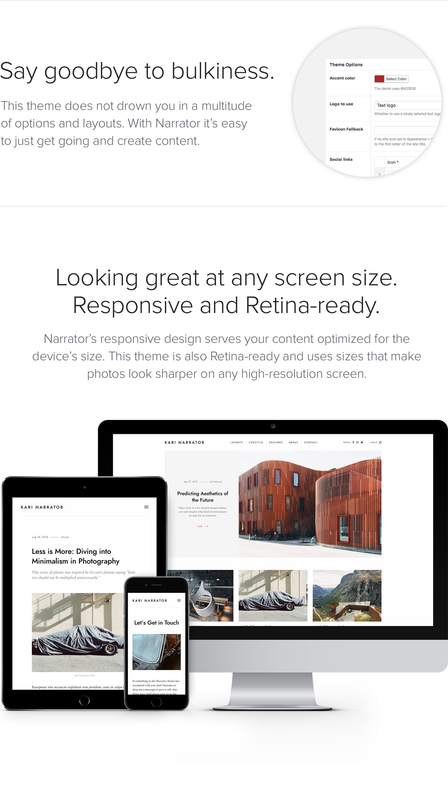 This WordPress blog theme is mobile-friendly, fully responsive, and Retina-ready. Demo content & narrative spirit are included. Translation-ready. Created by a huge VSCO fan, obviously. Proudly presented by Mauer Themes. All images in the demo courtesy of Pavel Povoroznuk and Yana Marudova. Demo images are replaced with placeholders when importing the demo content.